I think it was in Pete Brown‘s Man Walks into a Pub where I read about the origins of the two-room pub. 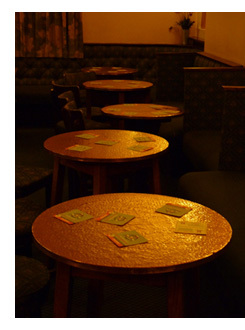 You know the division between, stereotypically, ‘bar’ and ‘lounge’: respectively, a rougher and readier spit-and-sawdust room where the dartboard and the loud young men are, and a more sedate and plushly decorated salon where your mother-in-law with pretensions to posh might comfortably sip at a sweet sherry. 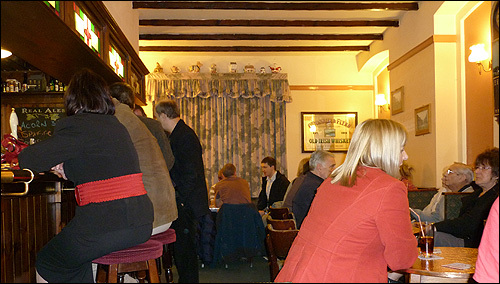 Like so much else in British society, the two-room pub is a product of the class system. Brown explains that the division dates from these pubs’ origins as coaching inns. Well-heeled passengers would be lucky enough to travel inside the coach, while the likes of you and me could only afford to cling on to the roof. When the coaches stopped so the horses could rest and the passengers sneak a quick pint, the two rooms of the coaching inn – a posh one and a scruffy one – could retain the physical separation of the two classes of passenger, so that the bourgeois traveller could not only continue to enjoy greater comfort than the great unwashed but never even have to set eyes on them. A lot of pubs that physically embodied Britain’s class structure have since had the two rooms knocked through into one, but a fair few remain, and the Freedom House is a fine example. Already my friend and bandmate, Dan has also become my neighbour today – well, almost – by moving to the edge of Walkley. A few of us are welcoming him to the area by taking him to the Freedom, probably our favourite Walkley pub. The same as always, we sit straight down in the posh room. I say ‘posh’ and it’s nothing of the sort, of course. It’s just that there are plenty of seats and tables, while much of the other room is given over to a pool table (and, interestingly, a collection of Laurel and Hardy memorabilia). And these aren’t just any tables. They have delightful copper tabletops. In most pubs, you have to drink quite a few pints before the world takes on a warm and hazy golden glow. At the Freedom you just look at its reflection in the copper tabletops. As we arrive just after eight, the posh room is occupied only by a taciturn old couple, who leave us to it soon enough, and we prepare to spread ourselves out. But this is to forget how suddenly the Freedom can fill up, and by half nine this side is as full as I’ve ever seen it. Our group numbers half a dozen, all of us aged from 30 to 40, and we’re younger than nearly everyone in the room. Old couples seem drawn to this space – by, I don’t know, its drawing-room feel, its homely decoration, its copper tabletops. Some are almost silent, content just to share the evening here. Others are verbose and animated, shoulder to shoulder with friends and daughters. The pub chat of older folks is very often the best, in all its rare richness and latitude. I relish sharing this space with them and their lives. All night I sup Moonshine from the local Abbeydale Brewery, a great session beer, ubiquitous in Sheffield, deservedly so, variably kept and served in various places, but in excellent nick here tonight, fresh as an unfolding daffodil. Here and there I’m reminded that the Freedom vies with the Bath Hotel for the title of coldest pub toilet in Sheffield. Glimpses into the other room, from trips to the bog and across the bar, find some kind of disco night going off alright: that’s where all the people our age are. The pub’s two rooms are alive, in two different ways. If premature ageing or middle-class pretensions have made me more of a lounge than a bar sort of person, it’s noteworthy that at the only Proper Local I’ve ever had, the New Talbot in Bearwood, Birmingham, this preference was reversed and I didn’t care at all for the lounge. At the only pub I’ve ever had a job at, the Tiger in Walsall, the bar always seemed the more interesting room to work in. Analyse that. On the other hand, in four years of regular drinking at the Broadfield, on the other side of Sheffield, I never once ventured from the lounge (an inertia which may have owed something to the bar at the Broady being nicknamed ‘the zoo’). But having two rooms seems to benefit the Freedom and the two sets of drinkers exercising the freedom of choice. We enjoy a long, long session – a proper pub night, spending hours in the same place, with the same people, on the same drink, and not a moment of it is ever less than fabulously stimulating and fun. Towards the end I’m buying a round: “Busy night then,” I observe to (I think) the landlady. They have busier ones, she suggests. It’s worth bearing in mind that a single, knocked-through space could never have offered the two distinct and appealing flavours of pub fun that have drawn people here in their dozens tonight. As pernicious as the origins of the two-room pub may have been, this is one class distinction that seems to have been worth preserving. The stuff about the origins of the two-room pub is great. Thankyou! I think the Freedom House is my ideal pub. Something to do with its layout: if you’re in the lounge bit, you’re close to the bar no matter where you’re sitting. That’s ace. But also because it’s a modest place which, like you say, feels warm and familiar straight away, with its small copper tables and the Eighties decor. And despite having a very specific, unusual look, its style doesn’t look like it’s been put together to make it deliberately quirky. There’s also a reassuring quietness about it. Last time we were there, I remember we were the only group of people for a while and, when I turned my head at one point, the place was filled but still quiet. Not in a creepy or lifeless way: just serene. I like that in a pub; I’m not much fun. And it’s the kind of thing that makes you want to stick around for longer because your head is only buzzing from lovely drink, not shouting and chaos. There is also something particularly nice and surprising about going from a busy road straight into such a lovely pub. I really need to go see that other room some time. When can we go again? Prior to Christmas it’s where we (as loud young men) were going to play darts at the weekend; mainly for the Moonshine. However the Moonshine went downhill and was replaced with a couple of other beers. Sounds like the Moonshine is back and on form so maybe we’ll pay a visit this weekend.